Antique 1920’s Black Embroidered Handbag-Drawstring closure-Ex.cond.Orig.Note! It is really a wonderful Vintage Purse, with beautiful raised embroidered design, as you can see in the photos.It also had a note inside, which I have included as part of the Provenance of the piecel..pictured in the fourth photo. The note reads ” This bag was my Mother’s. 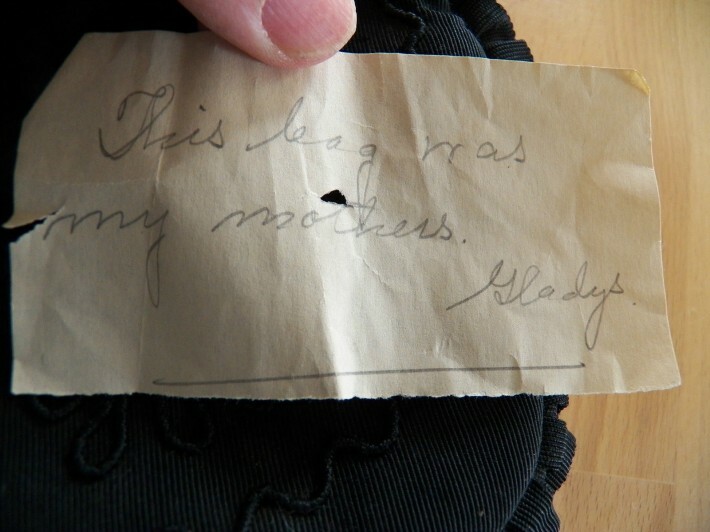 Gladys”.I don’t know who Gladys was, but it was important that whoever got this purse know to whom it belonged. I like to honor things that I find like that…gives the piece a sense of history, don’t you think? ?